Learnlight Writing is an on-demand service that allows learners to submit written materials to specialized tutors for detailed feedback, including mistakes, recommended phrasing, suggested vocabulary, and grammar tips. Purchase a license for Learnlight Writing. Email your text to our specialist writing team. Within 48 business hours of receipt, our specialists will review, correct and comment on your text with Microsoft mark-up features to facilitate the learning process. Writing submissions can be made in Word, PowerPoint or just text in an email. Each learner can make up to 4 submissions with a combined total wordcount of 1000 words per month. Learners who need to submit frequent written reports or presentations. Learners who communicate regularly by email and other written correspondence. Learnlight Writing has been designed to be as simple as possible. No need for any overcomplicated tools; just email our specialist team and they will get back to you in 48 hours. You can send our specialists any text you’re working on, from emails and memos to presentations and business reports. That way, you get help and learn at the same time. This service blends perfectly with Learnlight Digital, enabling you to send your writing assignments to our specialists for corrections, suggestions and an official score. 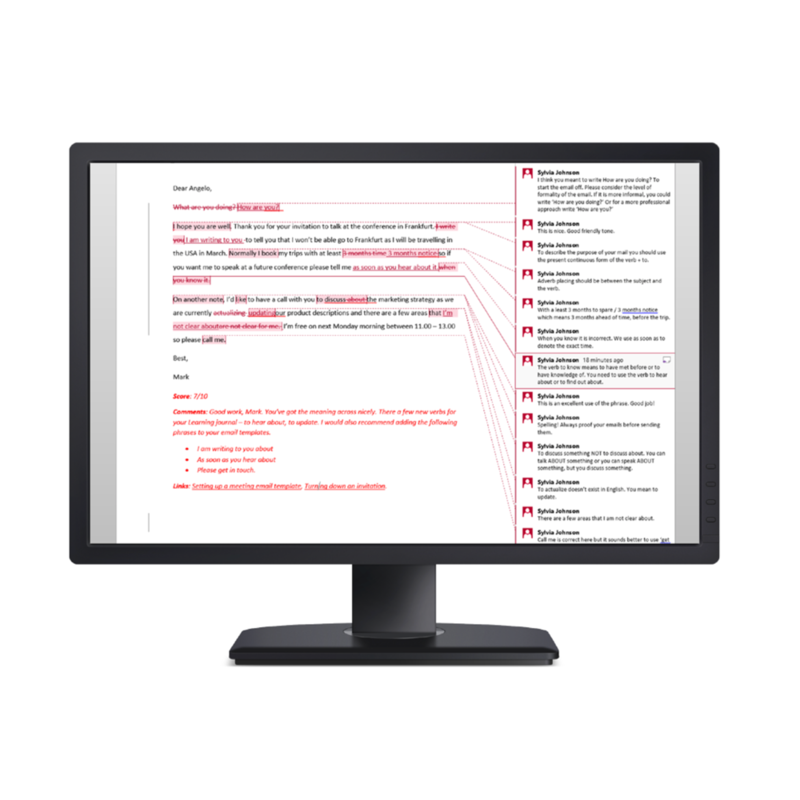 Learnlight Writing specialists maintain an extensive library of email templates that they use to help learners with a range of specific assignments.